We’ve been ensconced here for three weeks now, almost long enough to take root and it’s beginning to feel like home. To be perfectly honest, because we like the place so much and are so familiar with it, it feels like home almost immediately. However, our length of time here has allowed us to study (and I use the word study loosely) the wildlife of the campsite’s lake since being stocked with enormous Grass Carp and being used as a fish farm (for raising decorative Koi Carp), and compare it to previous years. When we first arrived, the floating mechanical fish feeding device, introduced last year, was absent and we rather hoped that a change of heart had been felt and that it would remain absent. Regrettably not, it returned a while ago. So, whatever trend last year’s crop of Koi Carp set, it will more than likely continue. Here’s a shot of the lake just to give some idea of size, since I have no idea how to estimate such a thing. Water fowl. We are used to their being a varied population of water birds breeding on the lake: Mallard, Coots and Little Grebe have previously been present in decent numbers. Last year there were four Grey Herons feeding around the lake. This year the lake supported two small families of Mallard (which we hardly ever saw). A day or two ago two Grey Herons appeared but I haven’t seen them since. Mallards and Grebes are naturally herbivores and there simply isn’t any herb left. I believe Coots may have a more varied diet but concentrate on vegetation. Herons, of course, take fish and frogs. Frogs. The lake has been inundated with frogs on previous years, the incessant chorus of which could be heard all night long (in the correct weather conditions). For us and many of our fellow regular visitors, it’s one of the charms of the place, though we must admit that some campers have left because of the noise. This made the owners keen on a frog control programme which, being French, this eating them. The frogs are still here and singing but are noticeably reduced in numbers. In addition to the water frogs, there used to be a vibrant population of tree frogs. The tree frog population has crashed almost unbelievably – we’ve heard the distinctive, rasping croak of just a handful, quite literally, and have seen none. Fanjeaux has suffered two consecutive unusually severe winters and we wonder if this is to some extent responsible for the tree frog decline. However, most notable this year and of particular concern is this: we have not seen one single tadpole nor small (young) frog of either species. I imagine that the dense population of fish may have vacuumed up all the frog spawn and that the remaining reduced population will not be getting replaced. Dragonflies. Previously, we have seen 18 species of dragonfly here, though that includes species at both ends of the dragonfly season. The damselflies have been present in great numbers with several mixed groups of 40+ pairs each seen ovipositing on floating rafts of herb at one time. This year, though we’ve seen 12 species in total, their individual numbers appear greatly reduced. The reduction is most noticeable where damselflies are concerned, simply because they were present in much greater numbers to begin with. The dragonflies, the “big boys”, tend to be more territorial and present in smaller numbers anyway. Of greatest concern is that there now seem to be five species (four damselflies, 1 dragonfly) completely missing; species which I believe should now have emerged. The missing damsels and dragon are particular dependent on/fond of the now absent vegetation. I must admit, however, that we have not seen damselflies in great numbers anywhere yet during this year of pathetic weather conditions, and those conditions may be partly to blame here, too. I believe, though, that this population crash/eradication must surely be largely due to fish predation together with a paucity of oviposition sites. 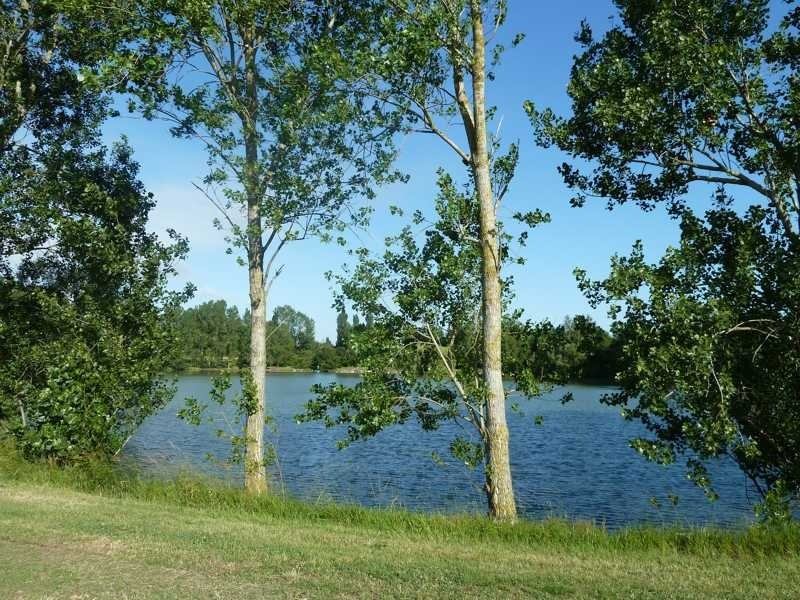 So, our hosts and their campsite are probably still the best in France but what had developed into an excellent and varied wildlife habitat is changing dramatically. Still, Luc is a farmer and the lake is here for a reason: irrigation. It is, of course, one of the main attractions for fellow campers, though most of them are content to stare at the water as a very pleasant landscape, which it undoubtedly still is, rather than as a rich ecosystem. On a personal level, though, I really do not like the transformation into intensive fish farm. Nor do several of my fellow campers sharing my enthusiasm for nature. What will the situation be like next year?